Legions of Empire's first offerings include the troops of the Spanish-American War. All figures come in a padded presentation box. All figures are 54mm in size, and are solid-cast in a lead-free pewter. 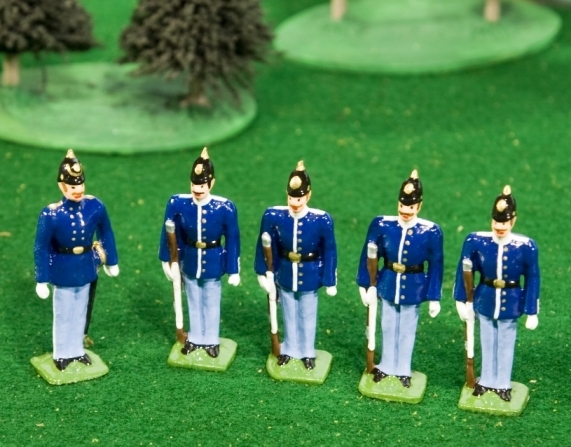 These are NOT childrens' toys, but are intended for adult collectors and wargamers. They are not for sale to anyone under the age of 14. Set 3: U.S. Marine Corps, Full Dress, 1898 - This set includes an officer and four privates of the U.S. Marine Corps in full dress. Coming soon! 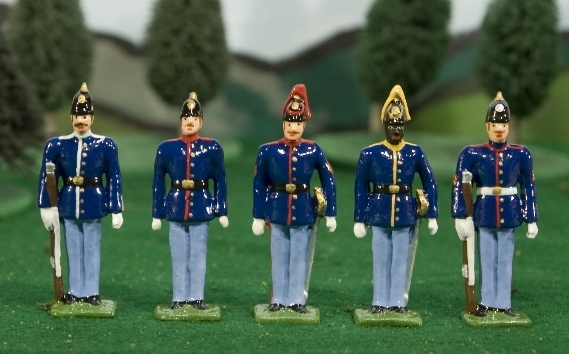 Set 4: U.S. Infantry, Campaign Dress, 1898 - This set includes an officer and four privates in shirt, hat, and mills cartridge belt. These figures can represent any of the U.S. Regular infantry units in the early part of the Spanish-American War. Coming soon! Set 7: U.S. 24th Infantry, Campaign Dress, 1898 - This set includes an officer and four black privates in shirt, hat, and mills cartridge belt. These figures represent the U.S. Regular colored infantry units (part of the famous "buffalo soldiers") in the early part of the Spanish-American War. Coming soon! 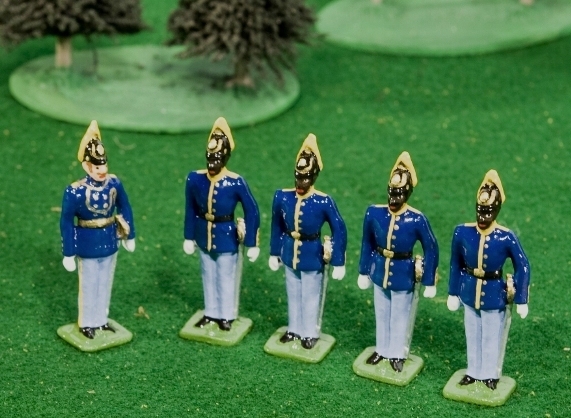 Future releases will include more Spanish forces for the period, as well as additional US troops in campaign and dress uniforms. The next subject planned is the Mexican Revolution - some constitutionalistas to fight with the US WWI infantry in your collection - followed by some Austro-Hungarian troops in parade uniforms. 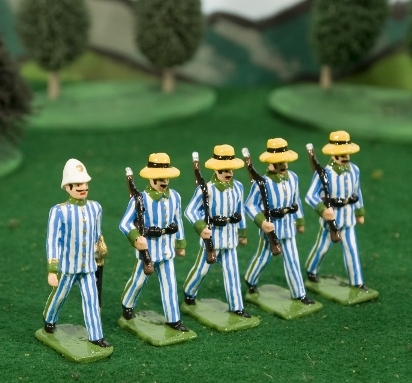 We also will be releasing a two-figure vignette of a French line infantryman and cantiniere in the pre-Franco-Prussian War uniform. A number of sets of infantry from Australia, Canada, and Britain are also contemplated, to fill in gaps where there are few offerings. 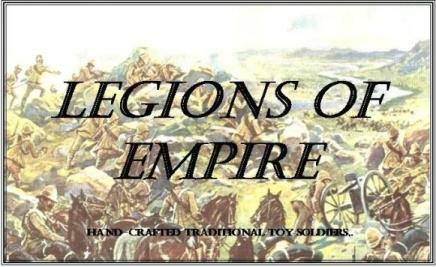 This line is called "Regiments of the Empire' and our first release is Set 8, the Artists Rifles. 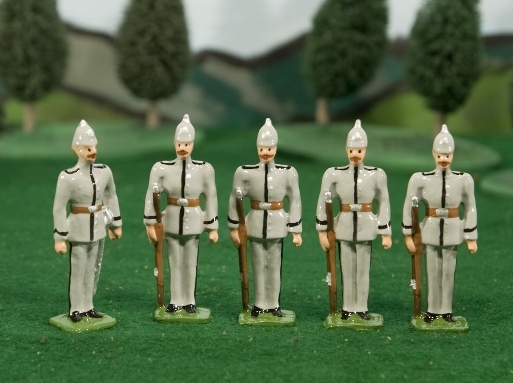 Future sets may include other of the British volunteer rifle units, as well as the Canadian Queen's Own Rifles, and units such as the New South Wales 2nd Regiment of Infantry. These would be complemented by a Victorian (Australia) foot artillery set in white helmets, after Richards' excellent plates. Please use the shopping cart provided, or e-mail us with order at sales@legionsofempire.com, including your name and address, and we will respond with a total including shipping. Shipping, packaging, and handling charges are straightforward: $7.00 US for each set ordered. Shipping charges are negotiable, so e-mail if you prefer slower delivery or are making a large order.